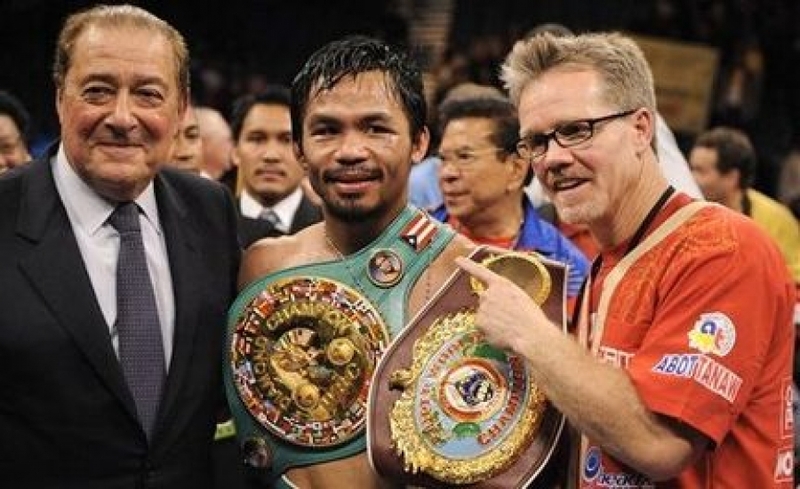 Filipino boxing icon Manny Pacquiao could retire from boxing if a rematch with archrival Floyd Mayweather cannot be made, according to his trainer Freddie Roach. The former eight-division world champion has won back-to-back fights against Lucas Matthysse and Adrien Broner since losing a close decision to Jeff Horn in mid-2017. Pacquiao, 40, has long stated his desire for a rematch with Mayweather, who defeated him comfortably by unanimous decision in 2015. WBA welterweight champion Keith Thurman – who himself returned from a lengthy layoff in January to defeat Josesito Lopez on points in January – has been mentioned as another possible opponent, but Roach has hinted hanging up the gloves might be Pacquiao’s preferred option if Mayweather doesn’t come out to play. “I would think that, yes,” Roach said in an interview with FightHub TV. “But the thing is, if we can’t get Floyd we might retire. The first Mayweather-Pacquiao clash remains the largest grossing boxing bout in history with £470 million in pay-per-view revenue and gate receipts. Mayweather, 41, has retired three times in his career already. After defeating Ricky Hatton in 2007 Mayweather hung up the gloves for 21-months before returning to defeat Juan Manuel Marquez on points over 12-rounds. The Grand Rapids, Michigan native walked away from the sport again in 2015 after beating Andre Berto immediately after the Pacquiao bout. Mayweather would return again to defeat UFC star Conor McGregor by TKO10 in 2017 and more recently fought an exhibition bout in Japan where he got the better of got the better of kickboxer Tenshin Nasukawa in under a round.